Regulatory compliance is an organization's adherence to laws, regulations, guidelines and specifications relevant to its business processes. Violations of regulatory compliance regulations often result in legal punishment including federal fines. 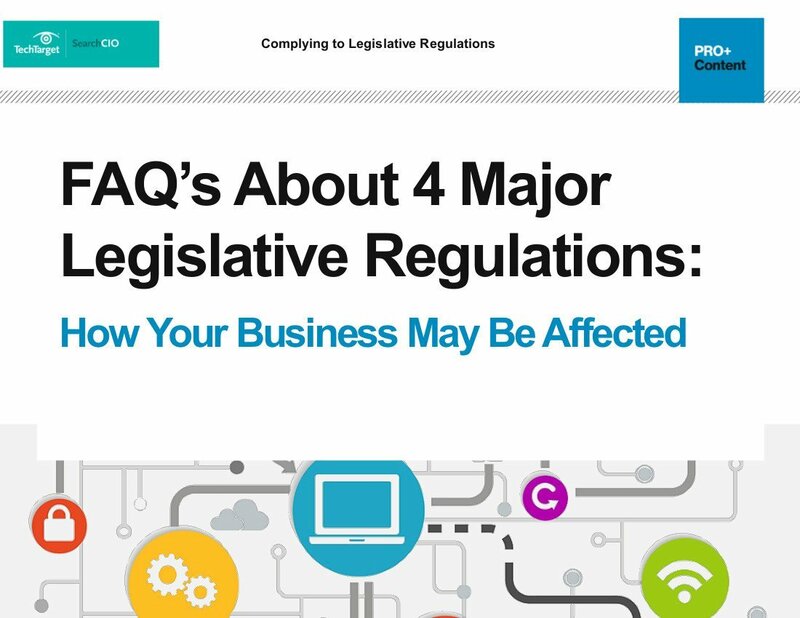 Examples of regulatory compliance laws and regulations include the Dodd-Frank Act, Payment Card Industry Data Security Standard (PCI DSS), Health Insurance Portability and Accountability Act (HIPAA), the Federal Information Security Management Act (FISMA) and the Sarbanes-Oxley Act. As the number of rules has increased since the turn of the century, regulatory compliance management has become more prominent in a variety of organizations. The development has even led to the creation of corporate, chief and regulatory compliance officer and compliance manager positions. A primary job function of these roles is to hire employees whose sole focus is to make sure the organization conforms to stringent, complex legal mandates and applicable laws. Regulatory compliance processes and strategies help provide guidance for organizations as they strive to attain their business goals. Audit reports proving compliance help companies to market themselves to customers -- for example, SOC 1, SOC 2, and SOC 3 reports allow vendors to prove compliance with regulations such as the Sarbanes-Oxley Act. Being transparent about compliance processes helps clients build trust in the processes of the business, as well as potentially improve the profitability of the company in the process. Some regulatory compliance rules are also designed specifically to ensure data protection. Poor data breach compliance processes can hurt customer retention and negatively impact the company's bottom line. With the frequency of data breaches continuing to increase, consumers are placing more trust in companies that closely follow regulatory compliance mandates designed to protect personal data. Companies that do not follow mandatory regulatory compliance practices face numerous possible repercussions, such as being forced to participate in remediation programs that include on-site compliance audits and inspections by the appropriate regulatory agency. Noncompliant organizations usually face monetary fines and penalties. Brand reputation can also be damaged by companies that experience repeated -- or particularly glaring -- compliance breaches. Constantly evolving consumer technology also poses compliance complications for companies. The use of personal mobile devices by employees in the workplace, for example, creates compliance concerns because these devices store sensitive, compliance-relevant company data. The proliferation of the internet of things has led to huge growth in the number of endpoints and interconnected devices -- and lacking security for mobile and IoT devices creates compliance vulnerabilities in organization's networks. For digitized companies to remain compliant, they must stay on top of required updates and immediately patch existing software when vulnerabilities are detected. Some industries are more heavily regulated than others. The financial services industry is subject to regulatory compliance mandates designed to protect the public and investors from nefarious business practices. Energy suppliers are subject to regulations for safety and environmental protection purposes. Government agencies are required to follow compliance regulations that mandate equality and ethical staff behavior. Healthcare companies are also subject to strict compliance laws because they often store large amounts of sensitive and personal patient data. Hospitals and other healthcare providers must demonstrate that they have taken steps to comply with patient privacy rules such as providing adequate server security and encryption methods. Regulatory compliance mandates vary by country, as well. The Sarbanes-Oxley Act is a U.S. legislation but similar legislation includes Germany's Deutscher Corporate Governance Kodex and Australia's Corporate Law Economic Reform Program Act 2004. Multinational organizations must be cognizant of the regulatory compliance rules of each country they operate within. For example, the EU's General Data Protection Regulation (GDPR) that went into effect in 2018 applies to all data produced by EU citizens, whether or not the company collecting the data is located within the EU. GDPR also applies to all people whose data is stored within the EU, whether or not they are actually EU citizens. How has companies' regulatory compliance burden changed in recent years as business processes have become increasingly digitized?